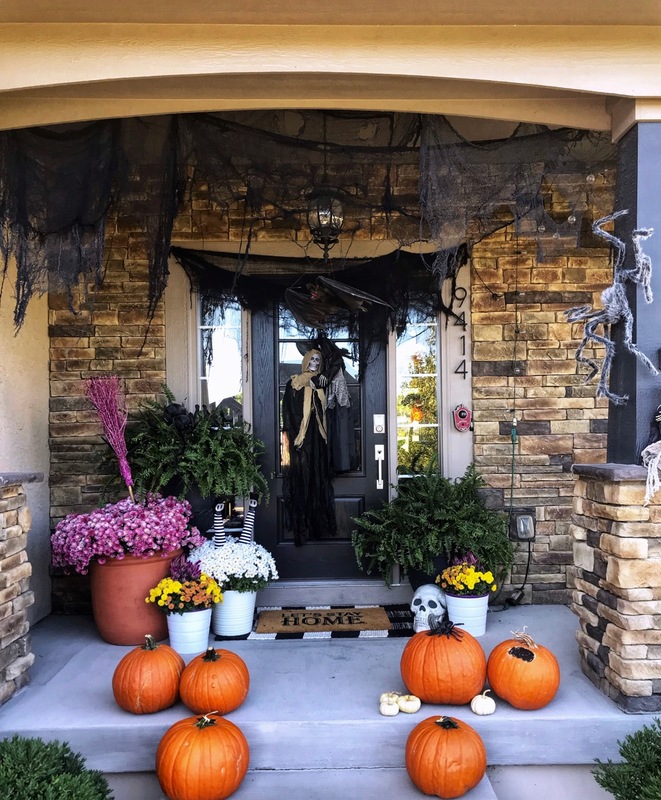 Welcome to our holiday home! 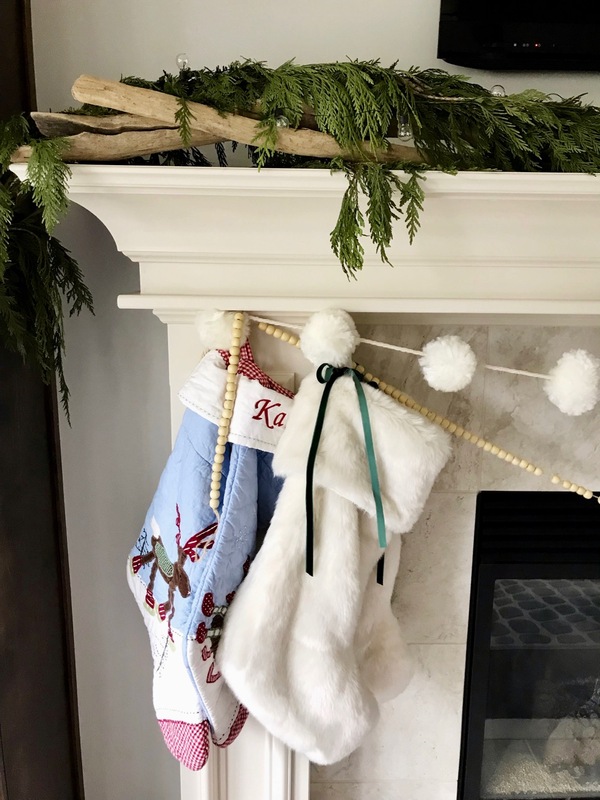 I'm joining 29 other bloggers on a Christmas Home Tour. A huge thanks to Marty at A Stroll Thru Life for putting this together every season! 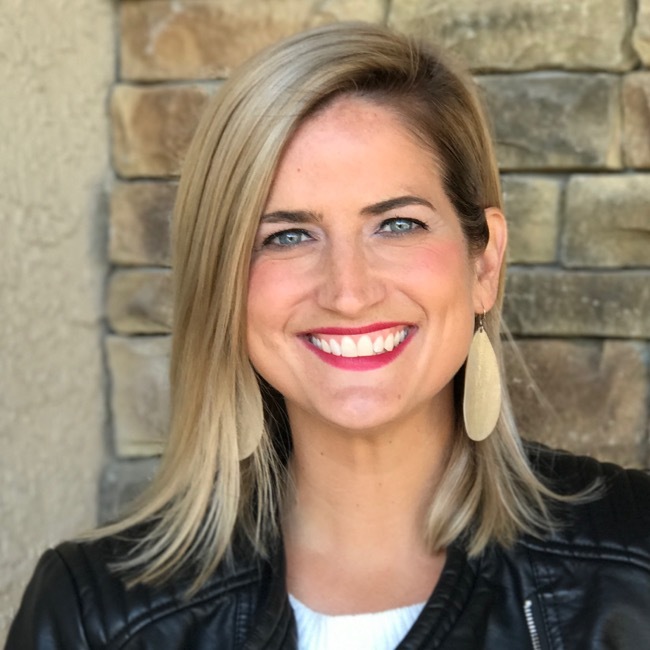 If you are visiting from Haneen's Haven, I'm so glad you're here! 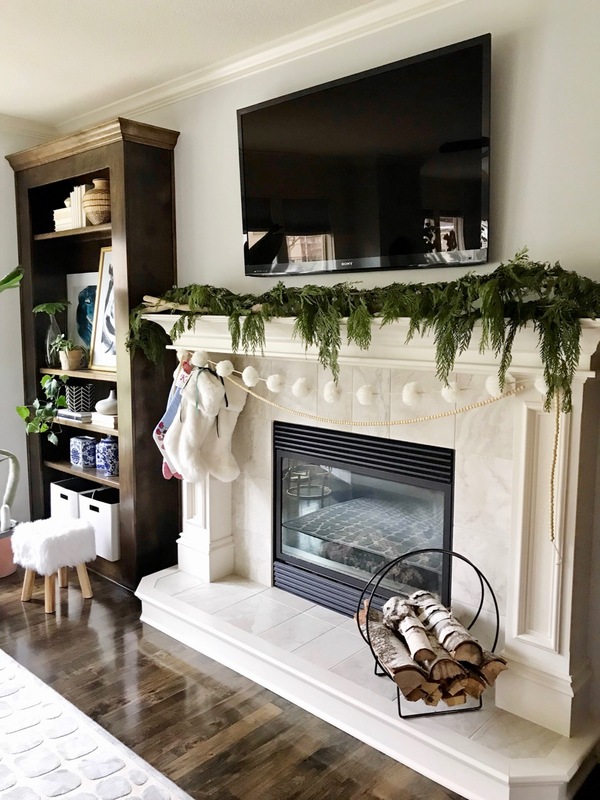 I love to decorate our home because I love creating an environment that feels casual and cozy and reflects us as a family. 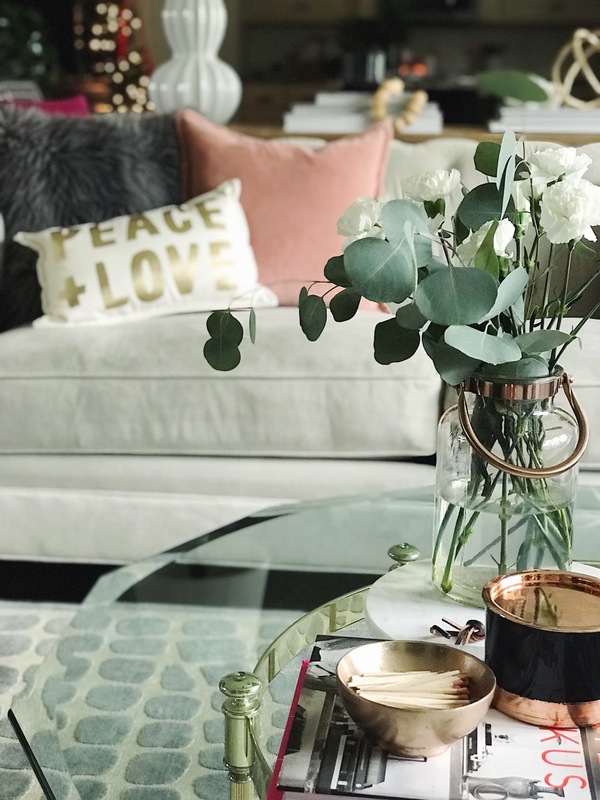 I believe decorating a home you love doesn't have to cost a ton! 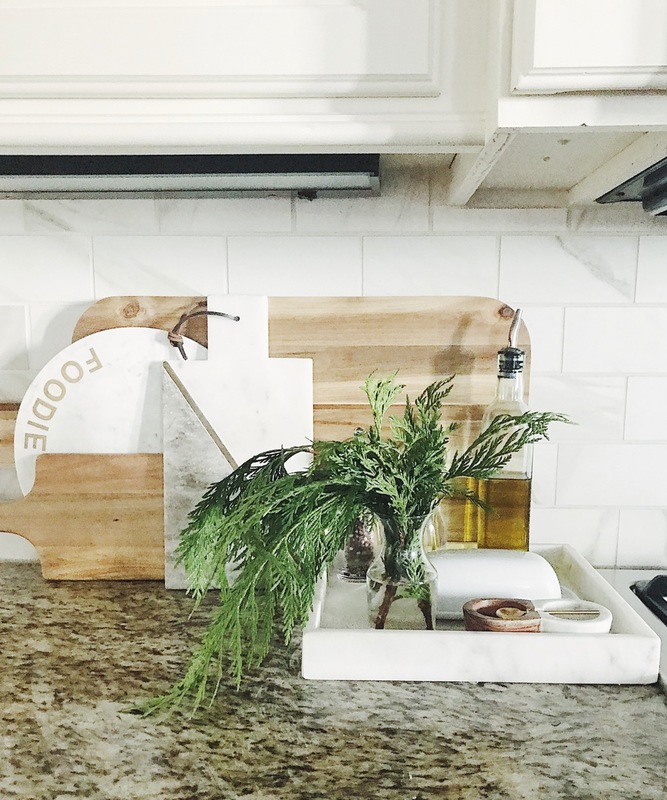 I also believe in using things in your home that you love, despite any "rules" that people think exist. 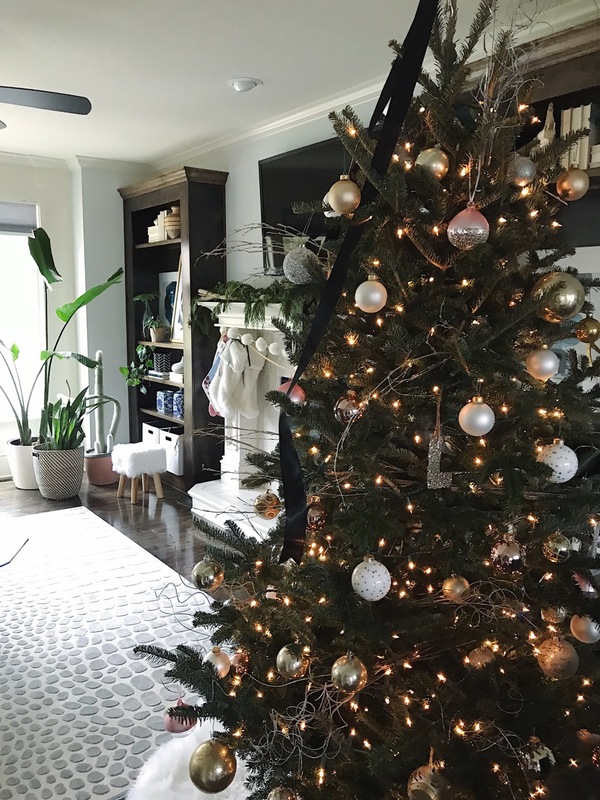 Even though I don't do a ton of decorating with trinkets and Santas and snowmen this time of year, our home is festive and cozy with lights and candles and fresh greens and cozy textiles! The older I get, I care more about a feeling, and less about bringing stuff out of bins! When it starts feeling like clutter, I know I need to scale back! 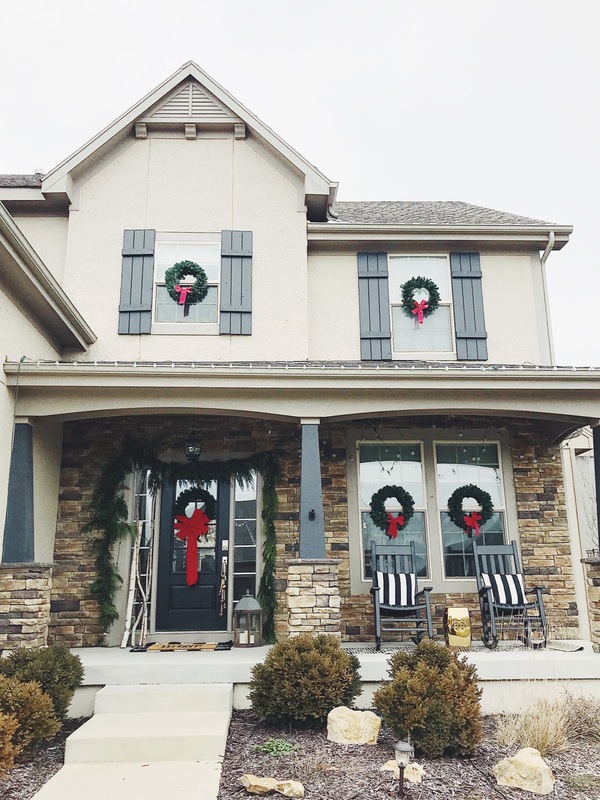 Also, this year, I barely spent any money on our Christmas home which just makes me happy! Let's get started! 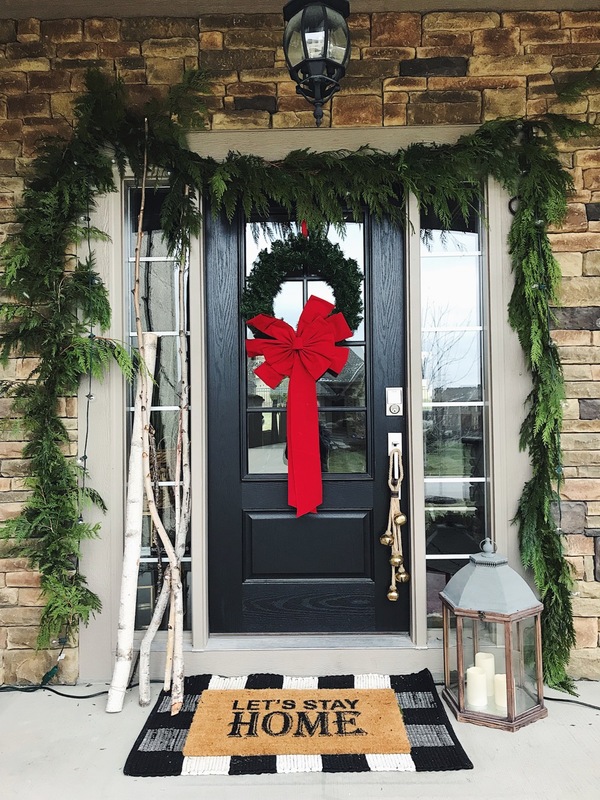 A few years ago, I started putting a wreath in every street-facing window and I just love it! 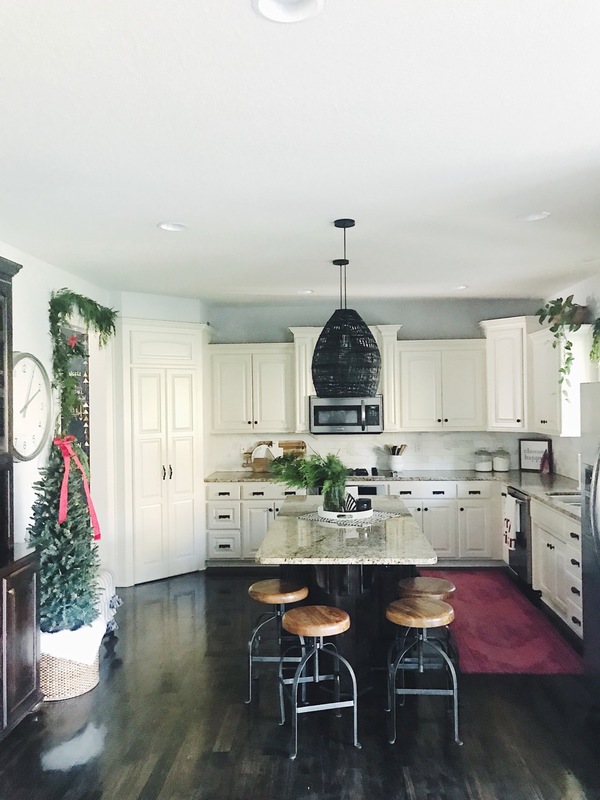 It's such a classic holiday look with the red bows. 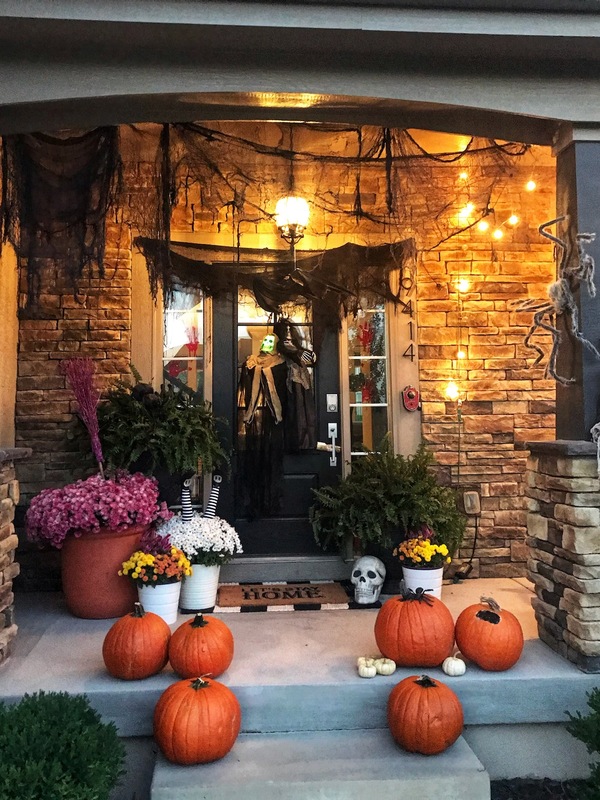 I keep the porch super simple as well, adding string lights, fresh cedar garland, birch sticks, and lantern. 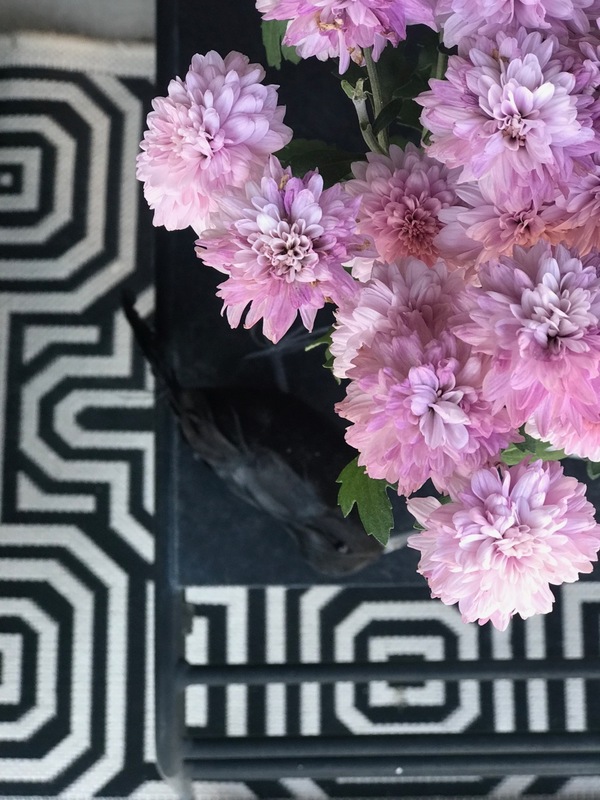 The gold garden stool adds a little pop and I pretty much keep black/white striped pillows on my rockers all year long. 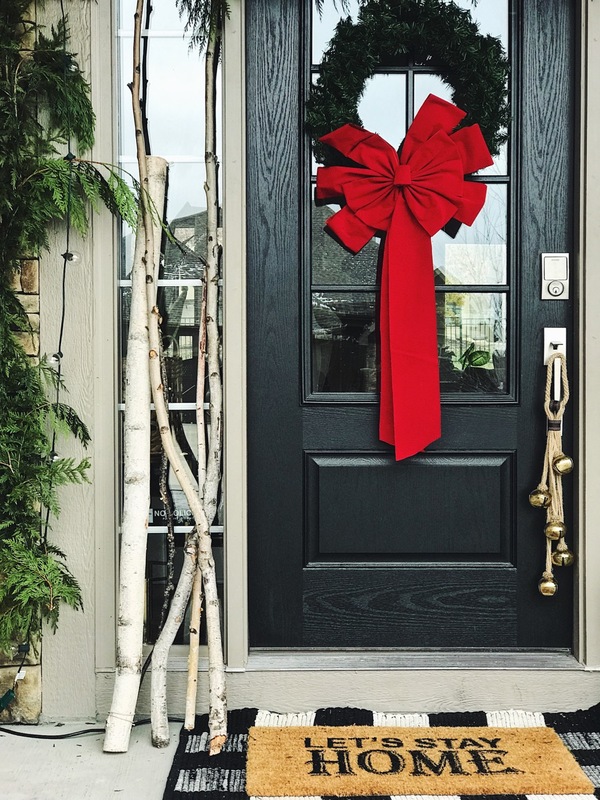 The only purchases I made for the porch this year were the bells on the door and one large birch stick (both from Hobby Lobby). Also, I buy fresh garland every year from Costco! 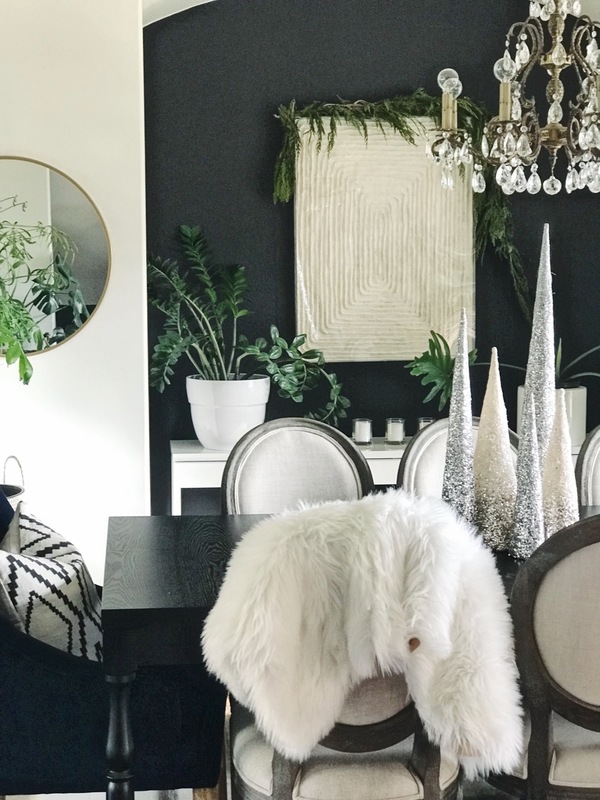 I'm just reusing the same rugs I used for our fall home tour because "Let's Stay Home" definitely fits for us in the winter! 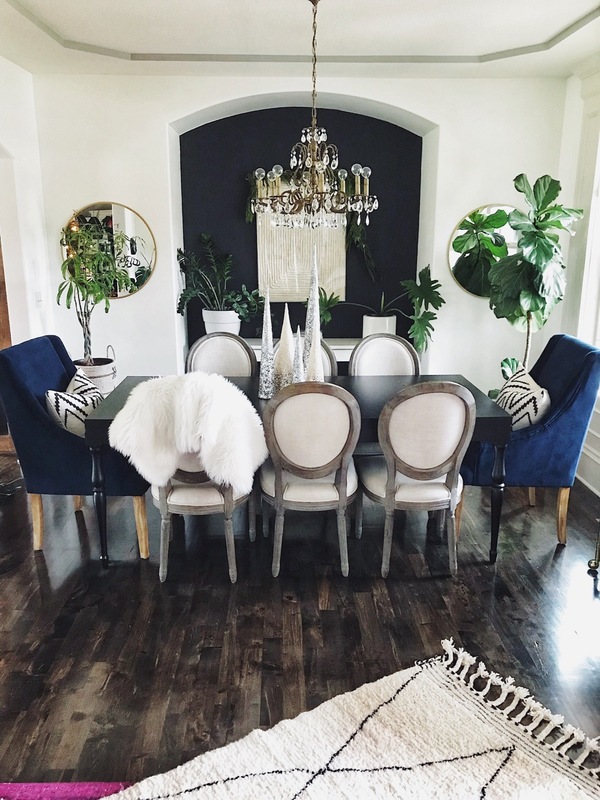 Our dining room is one of my favorite rooms in the house because it always stays clean! 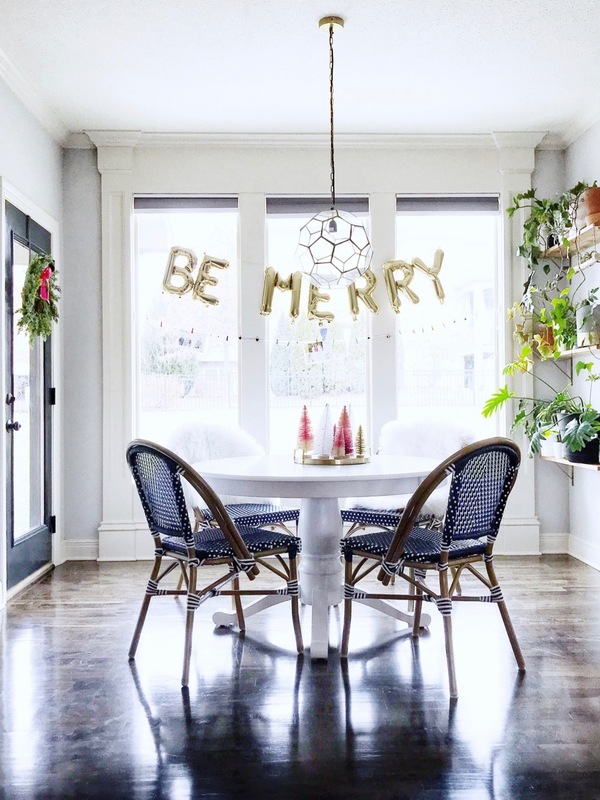 And it's always a space that looks modern and festive with minimal effort. 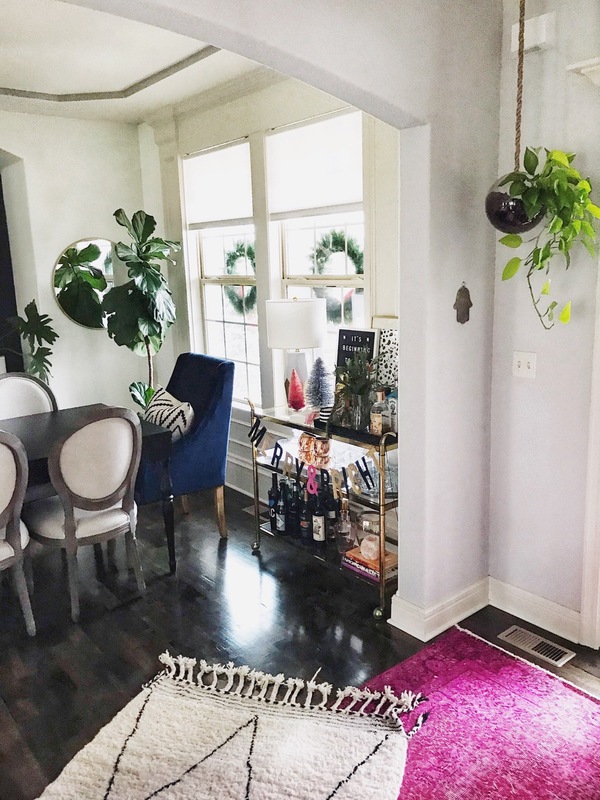 I kept it very neutral this year and let the plants/greenery do the talking (I'm a crazy plant lady)! 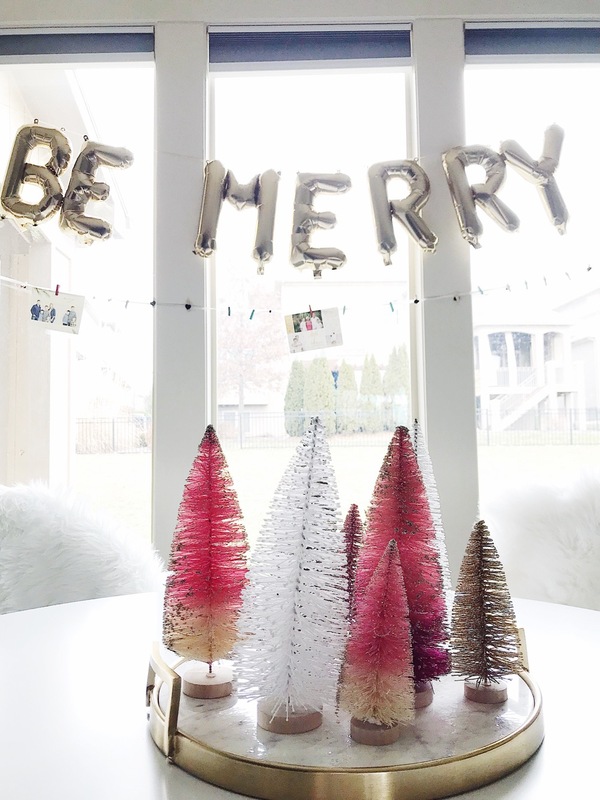 Glitter trees and a faux fur add warmth and texture. 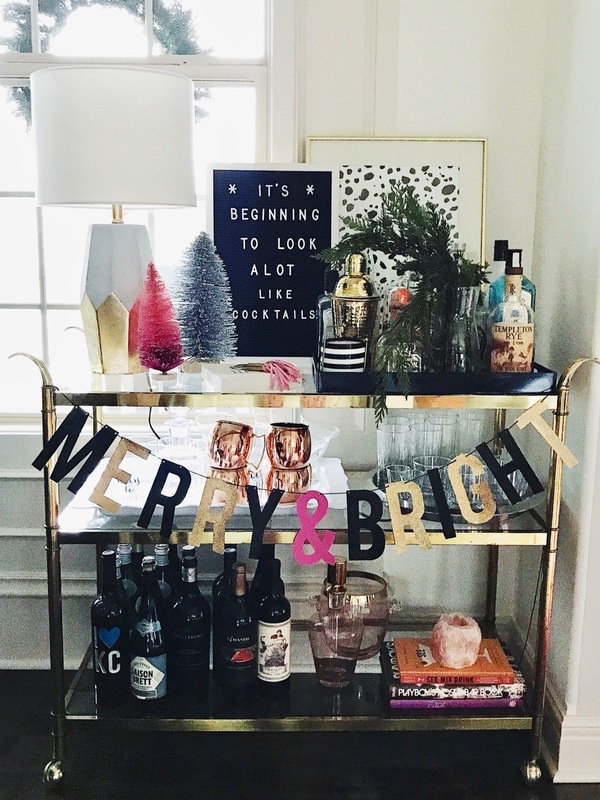 This vintage bar cart is always fun to switch up for the seasons. I love to junk it up and add a pop of color. 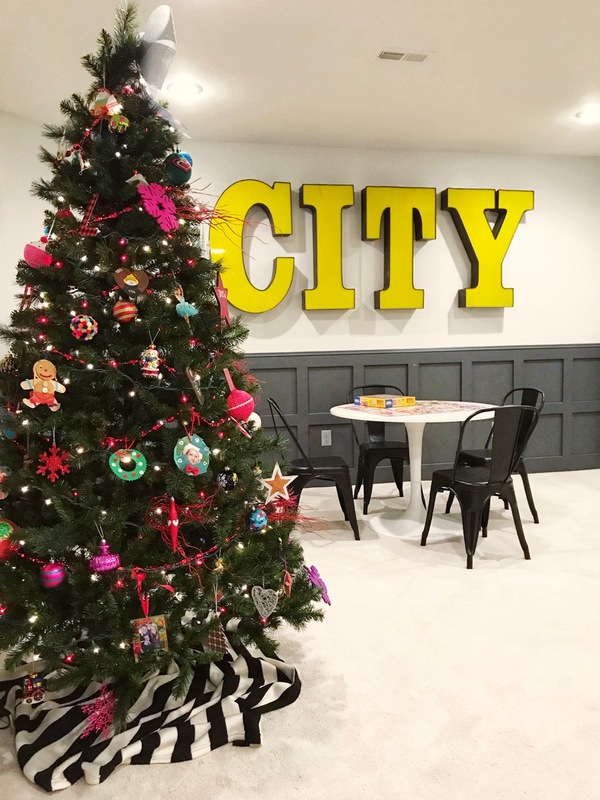 The real star of the show in the living room is the real Christmas tree! 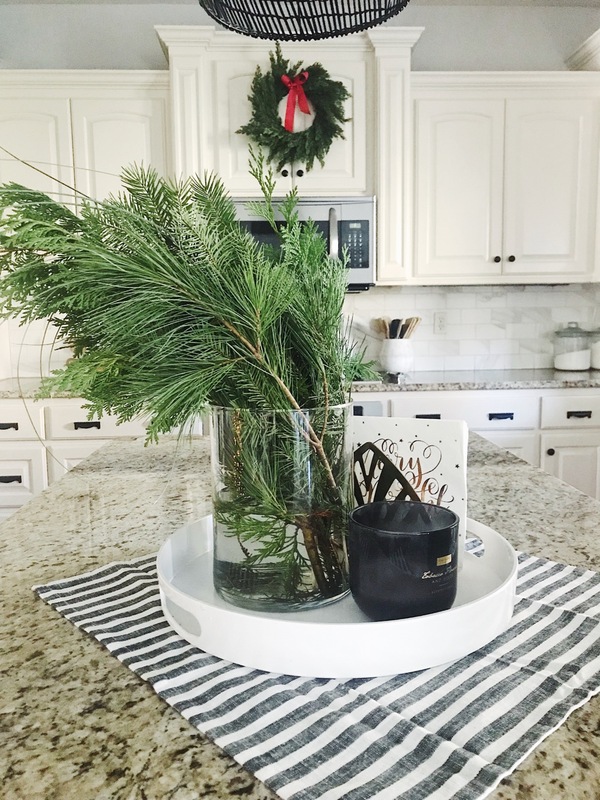 We get a Fraser Fir every year and this is the second year I started putting it in a large rattan basket. 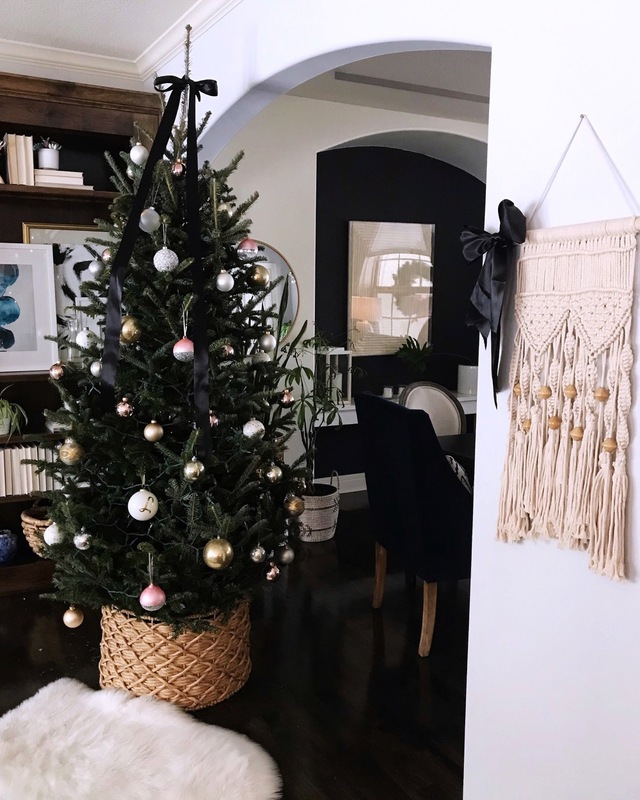 No more tree skirt to mess with and the needle clean up is so easy now! 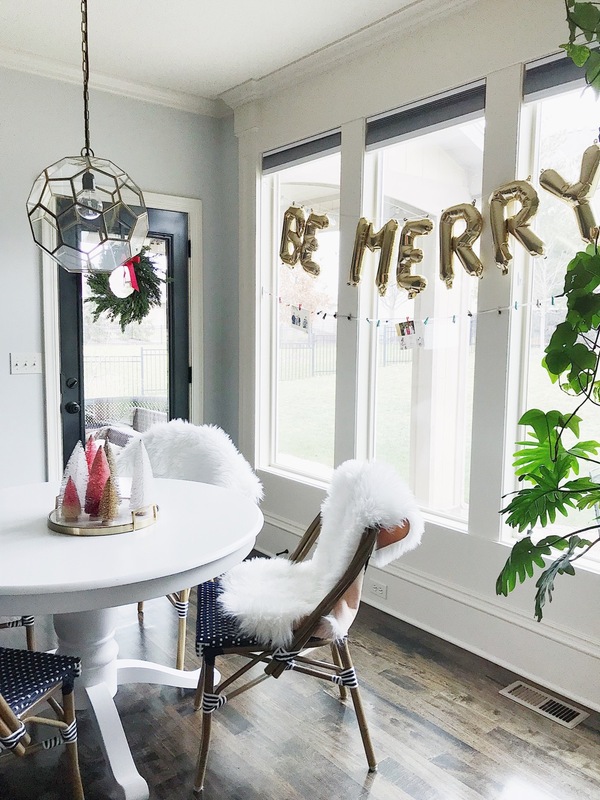 Our breakfast nook hosts a simple wreath/ribbon, inexpensive bottle brush trees, and some festive balloons! I also hang our cards across these window using what looks like a clothesline. I only have two cards so far, but soon the line will be full! 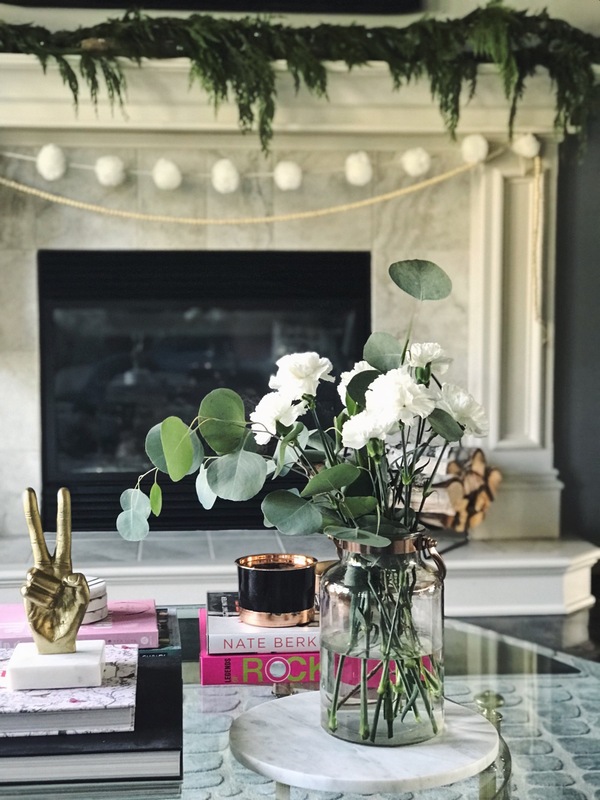 It adds so much to this room with very minimal effort! I just use ribbon and command hooks. 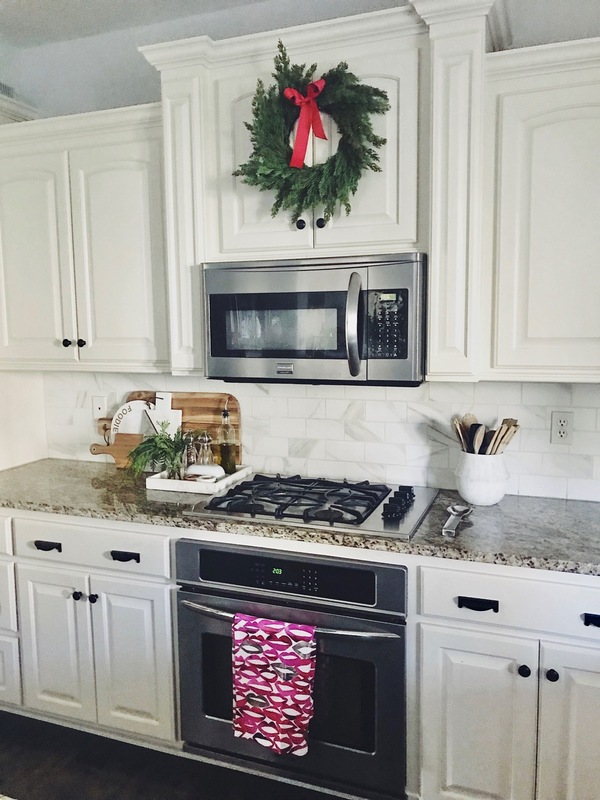 Next up is our kitchen. 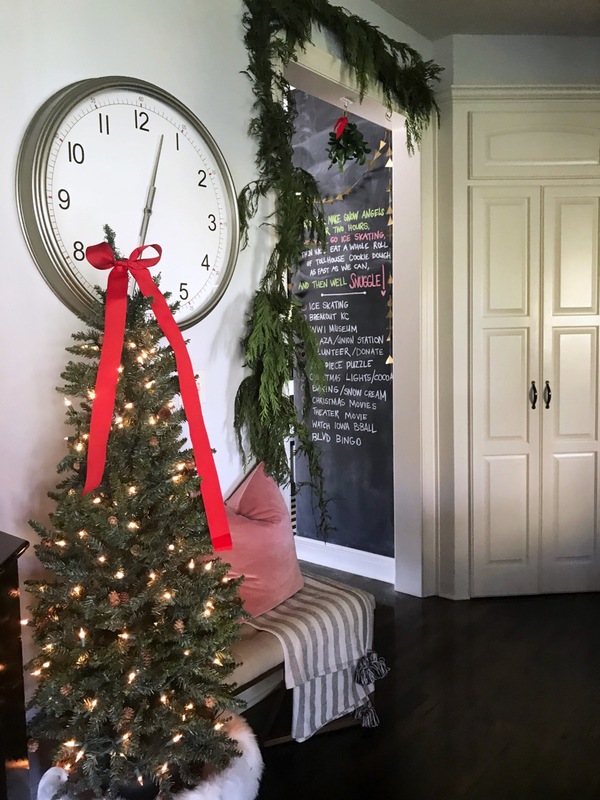 I used fresh garland in here and one faux wreath. I also bought a bunch of greenery from Whole Foods for $5 and I love how dramatic it looks on the island! I'm all about the fresh greens this time of year and all year long! They give life to a space! I also LOVE pink! 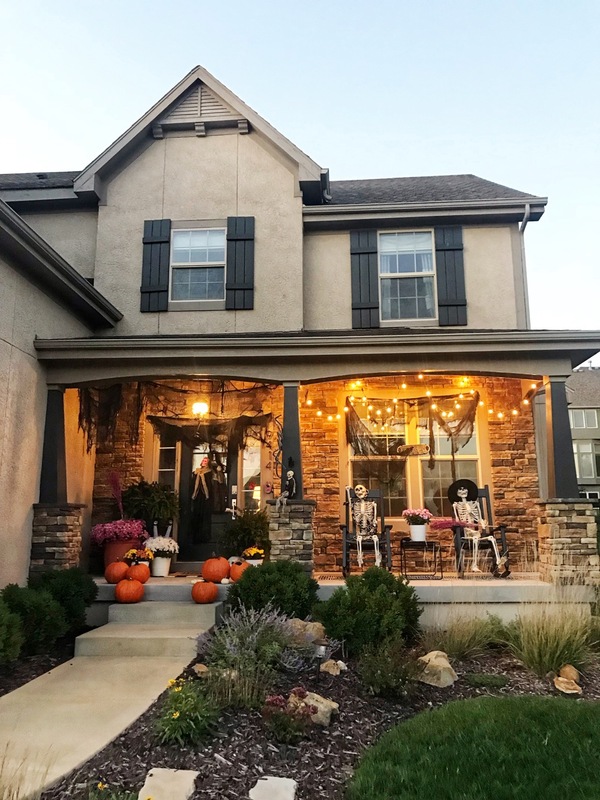 I have it all throughout our home, and I keep it for all seasons. I'm loving pink and red together so much right now! 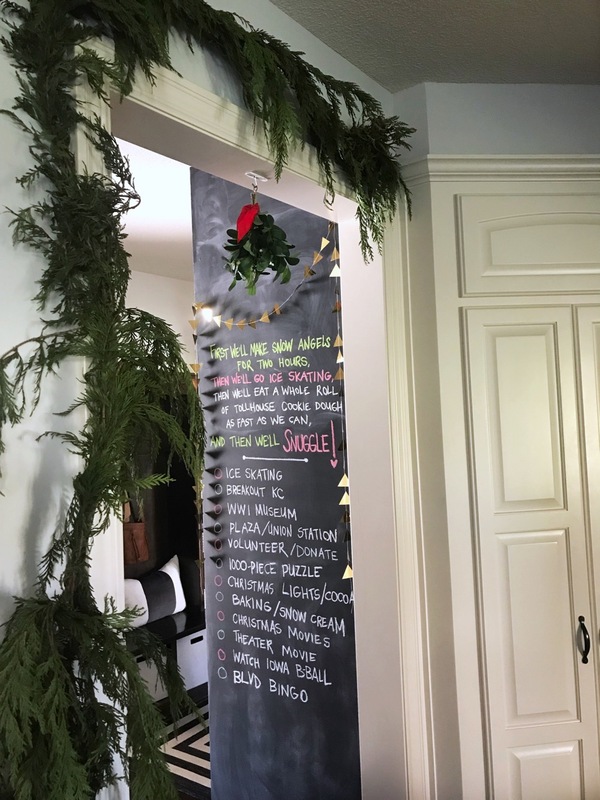 Right off our kitchen is the mudroom with our chalk wall. 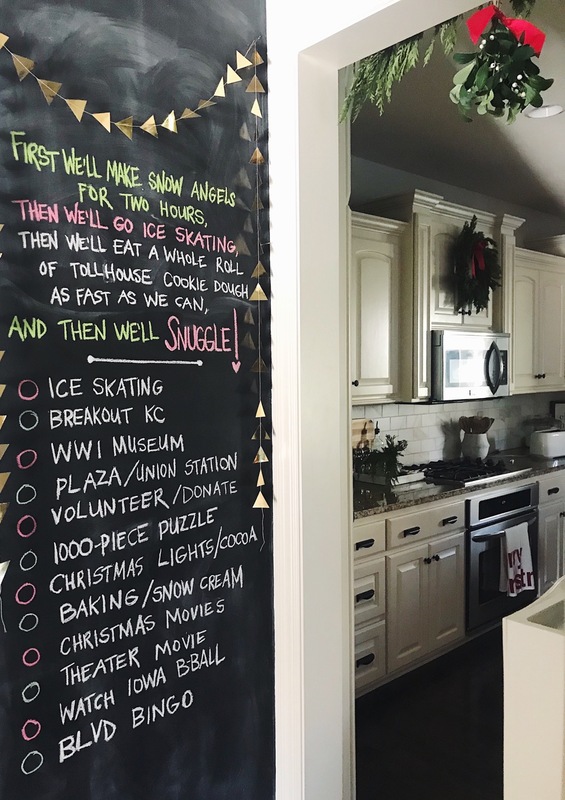 I change this up every season with a bucket list that the kids help us decide on. It's a fun and easy tradition and keeps us honest! We never get to everything, but it's fun to dream! Ha! 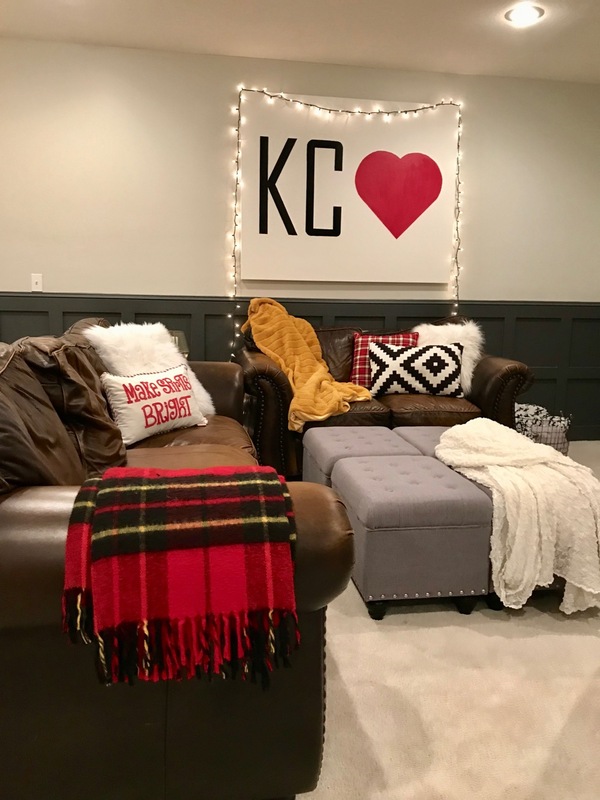 And because there seems to be a lack of traditional color in our upstairs, our basement is full of traditional colors and pillows and blankets! We have a fake tree down here with all the kids ornaments and red/white lights! 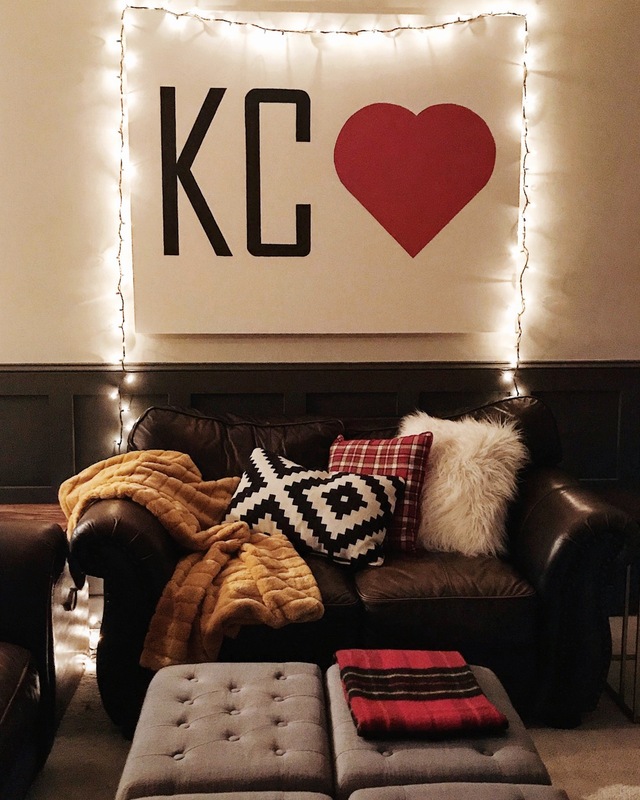 We spend a lot of time in the basement in the winter and we love having this second cozy space to hang out in! Also added a new table/chairs to play games and work on puzzles! 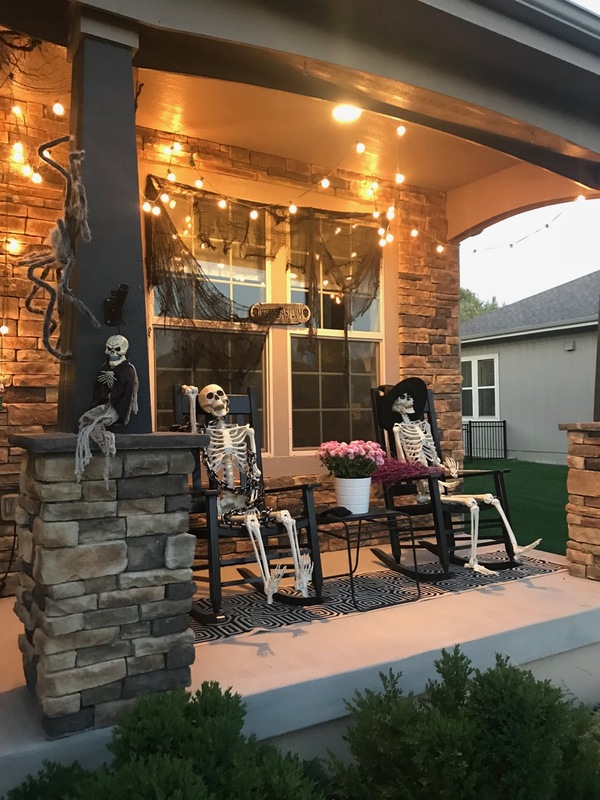 I'm calling this the "creepier" porch because our kids (ages 11 and almost 10) decided this year that we needed to go a little "scarier" with our porch decorating. It's still not the caliber they want because I will never part with my plants or pumpkins (ha! 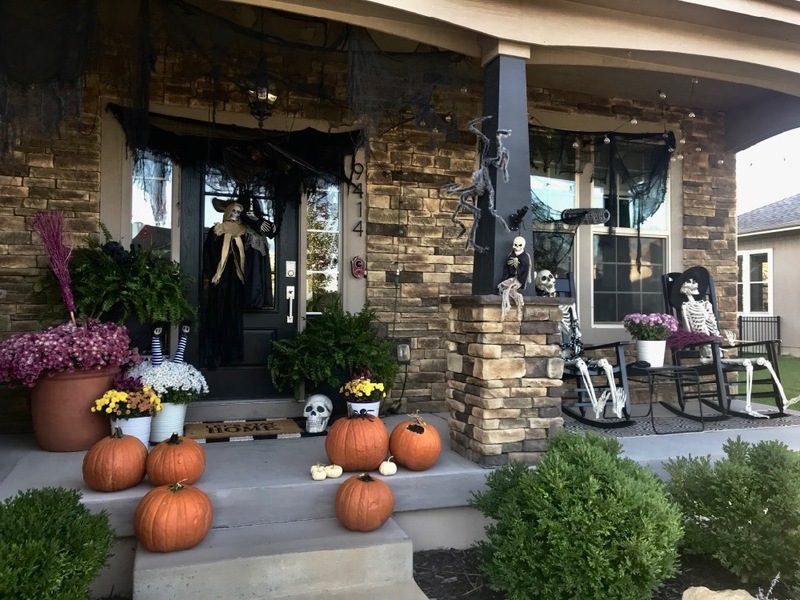 ), but we did add a few things this year. I'm going to let the pictures do most of the talking! Let's get started! 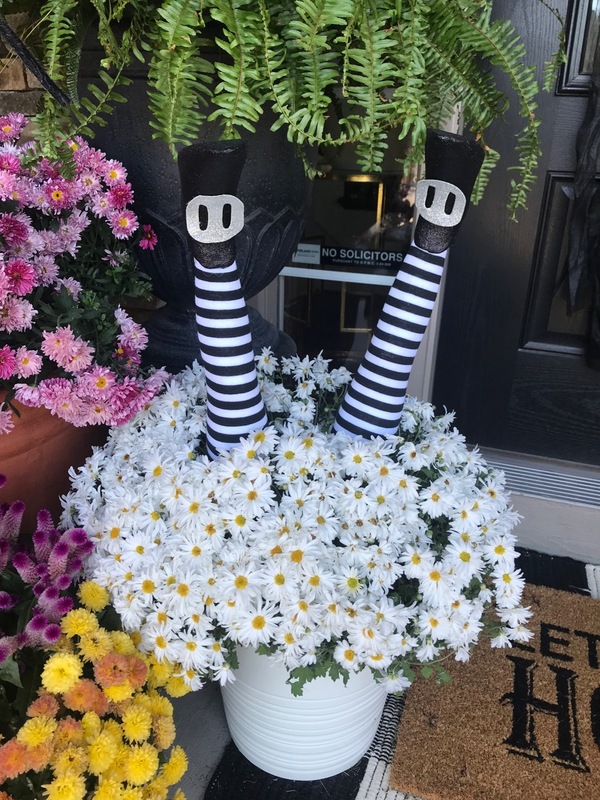 I like to take my summer ferns into fall! These Kimberly Queens have been doing well all summer in this spot and are still doing well into late October. They are the gift that keep on giving! 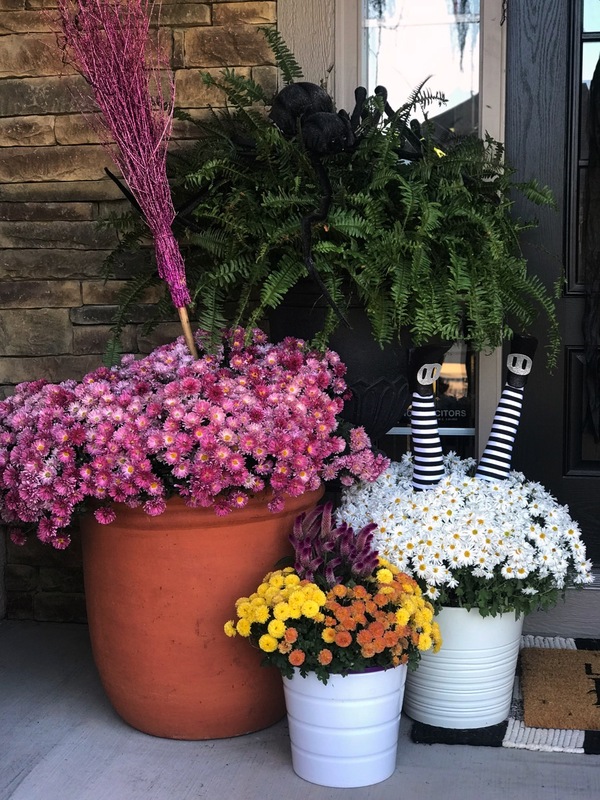 Staggering their height and adding some colorful mums help flank the door. 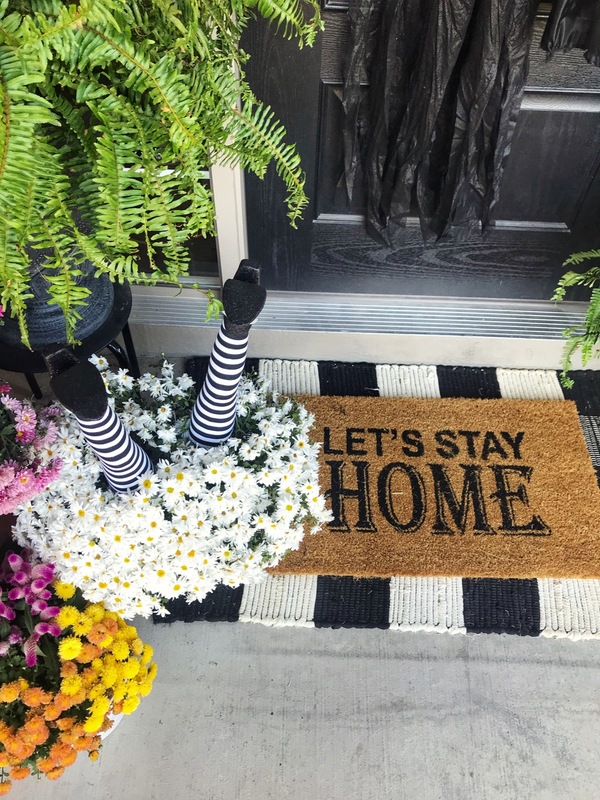 Pop in some witch legs (Target last year), a broomstick (old from Tuesday Morning), and a large spider (Party City this year), and you're done! I also believe if your mums and/or ferns begin to die, leave them! They add to the appeal! It's genius! 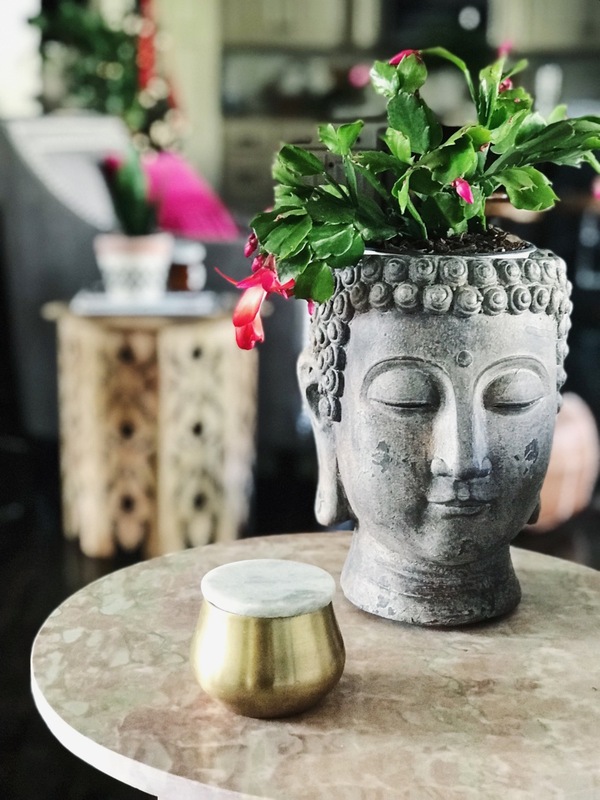 You don't have a black thumb, you're just doing more "decorating"! I also changed up our layered rugs for fall. Both rugs are from Kirklands. The bottom rug is an indoor rug, but it can be washed, so I'm making it work out here! I love the texture and pattern it adds. You can't ever go wrong with black/white! 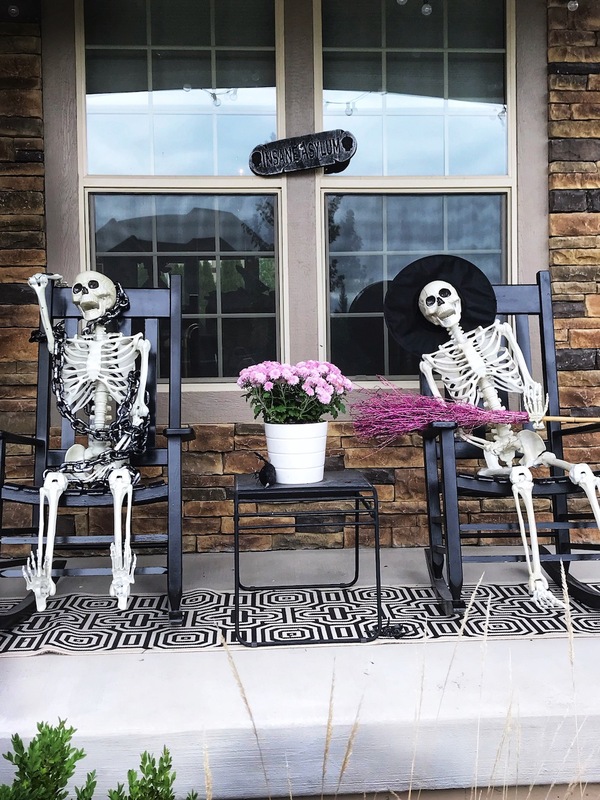 This dead bride and her mate make up our "wreath"! His face changes colors! These were inexpensive from Menards and Ross. And that creepy bat just hangs from fishing wire from our lantern. He's from Party City! 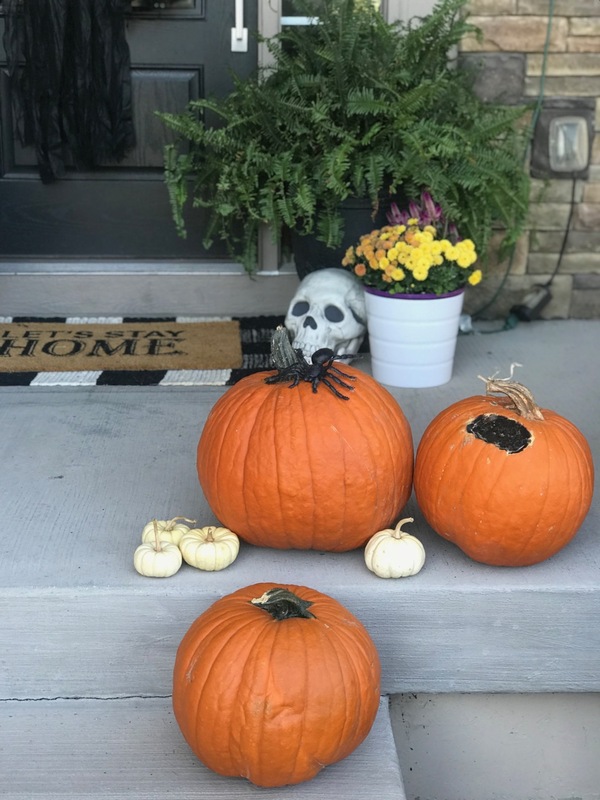 I picked up several large pumpkins from Aldi a few weeks ago for under $3 each! 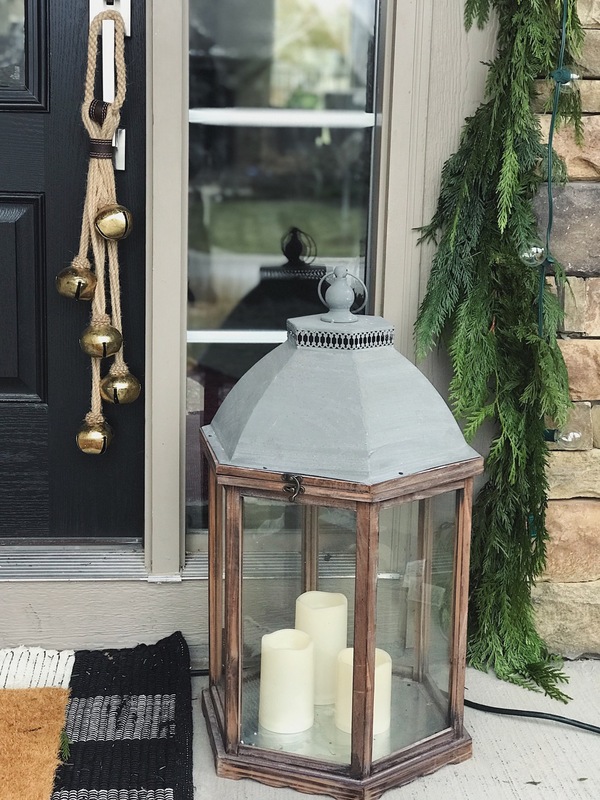 Such a great way to make an impact on a porch on the cheap! One of the pumpkins is rotting, but again, I like it like that! It adds to the feel, so leave it! Unless it stinks! The faux spider is from Dollar Tree. 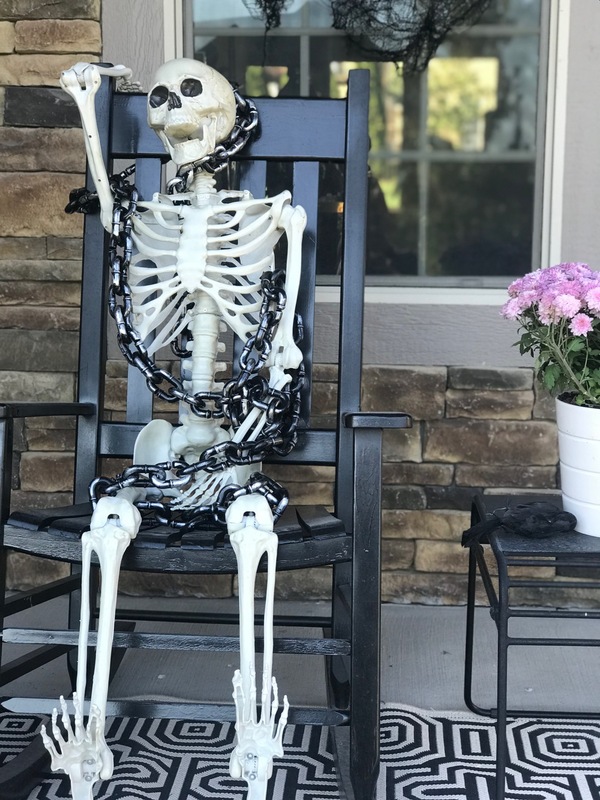 Moving to the other side of the porch, I knew I wanted to pull the trigger on some life-size skeletons this year. Every year I think about it and never do it, so this was the year! I ended up purchasing these guys from Walmart! 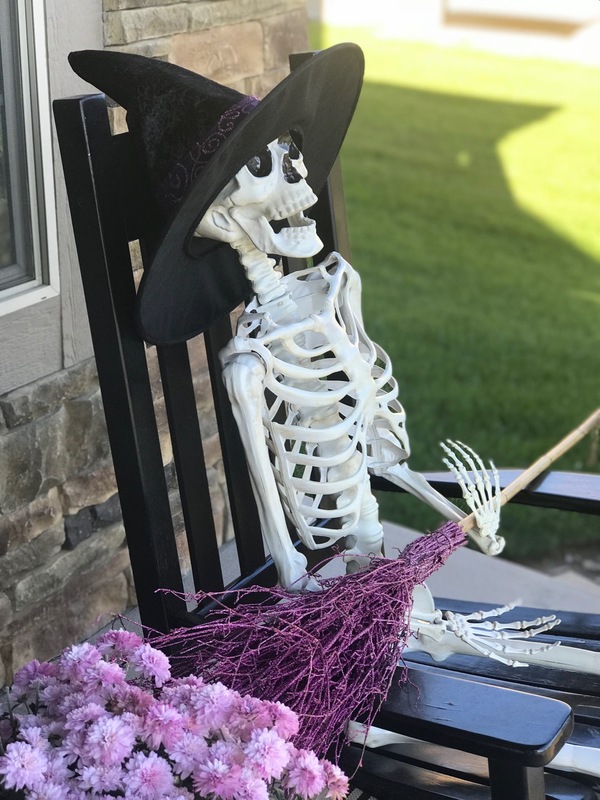 And my nine year old daughter is actually the one who decided to put one in chains and dress the other as a witch. I just love these two! Ha! And we added the Insane Asylum sign right behind them. And eventually added creepy cloth because creepy cloth is EVERYTHING! A dead raven next to your mum makes it look less "pretty", right?? 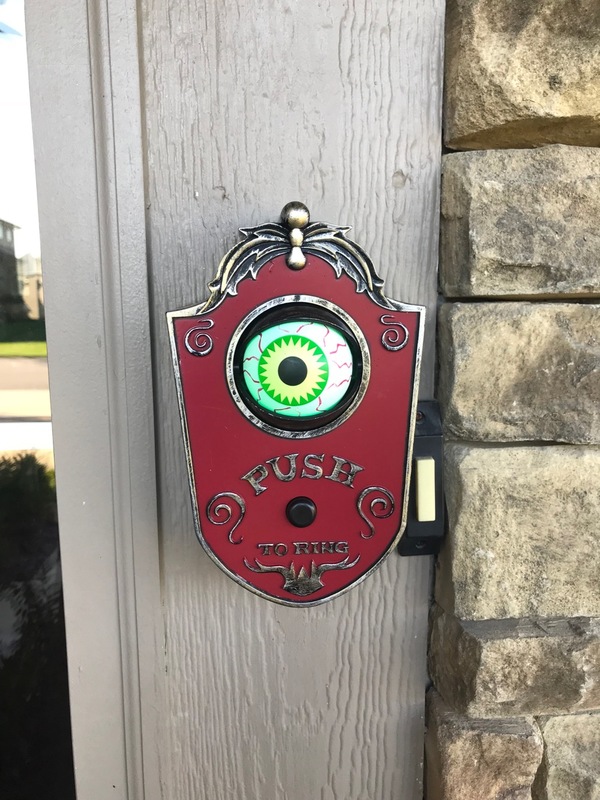 And last but not least, we added this creepy animated doorbell that talks to you when you push it! 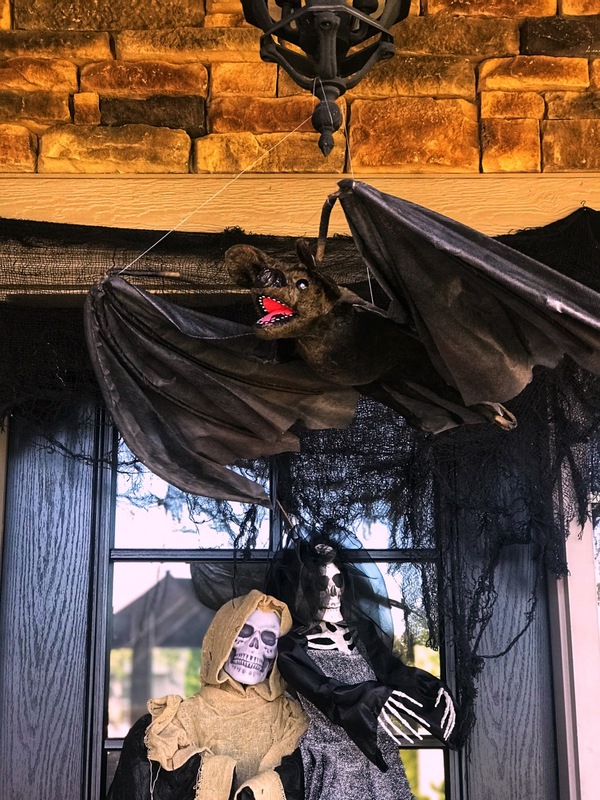 This is my kid's favorite part of the whole porch! 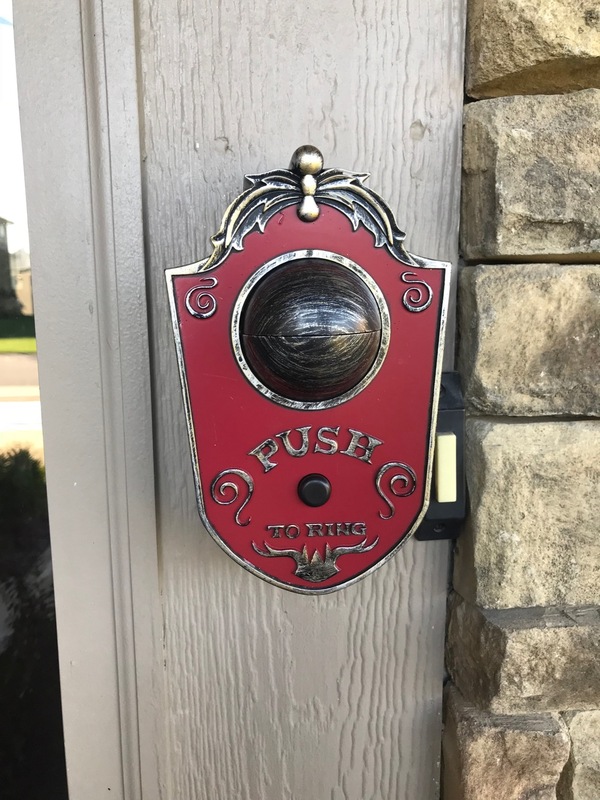 We just nailed a small nail right next to the actual doorbell. 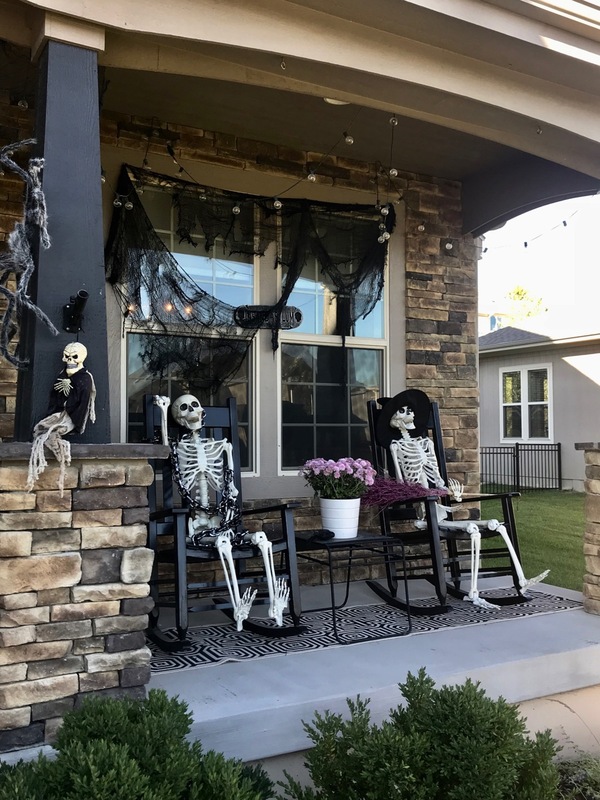 We are hoping kids will push it on Halloween night! Here is a wide shot of the whole porch. I did add tons of creepy cloth to finish everything off! Everything just looks better with it! We hammered nails to the inside of the porch walls to hang it from and it works perfectly! And here are a few night shots, because it's just more fun that way!